After I watched The Force Awakens for the second time, one of the many things my friends and I brought up was lightsaber combat. The iconic weapon of Jedi, Sith, and many other Force-users was featured prominently, and of course I had a few feelings about just how the combat was depicted. Like pretty much every other piece about TFA, this is not spoiler-free. You have been warned. My interest in lightsaber combat and just how realistic it is has led me to some interesting places, like the time when I tried to recreate Jaina’s pose on the cover of Invincible and fell into a bookshelf. At least once while watching the prequels and doing the usual making fun of them, I have commented on how much I love the fight choreography. And one of my first thoughts on TFA’s combat was just how much it suited each of the characters. Three viewings later, I found myself muttering about lightsaber combat and about how good fight choreography can be very good characterization. Lightsabers have a habit of falling into people’s hands at the right time and place. Luke received his father’s lightsaber as a gift from Obi-Wan Kenobi, soon before the old Jedi sacrificed himself to let Luke and his friends escape. Rey wanders through the basement of Maz Kanata’s castle, and opens the one box that has Luke’s lightsaber in it. The very fact that she refuses the gift, refuses the call to adventure, is a clear sign that it’s going to be hers at some point in the future. And much like Luke, she finds herself in a lightsaber fight before she’s really ready. Even Finn gets in on the action; a lightsaber is a perfectly valid weapon when there are First Order soldiers everywhere and you need a quick defense. Like usual in the Star Wars universe, being untrained doesn’t mean that you can’t use a lightsaber. It just means that how you use it gets more interesting. It is entirely plausible that Rey can figure out how to use a lightsaber, having never seen one before. We see her carrying a staff, which she uses both as a hiking pole and for self-defense. She deftly trips Finn at BB-8’s request, and it’s clear that she knows how to use the staff as a weapon. It makes sense that this translates well into skill with a lightsaber. Everyone in the theater cheered when she summoned Luke’s lightsaber into her hand and attacked Kylo Ren, and though she clearly isn’t sure how to handle a lightsaber, the skills with a staff turn well into maintaining her defenses. This is a quite unique fight; neither combatant is entirely sure of what they are doing, but that isn’t going to make them back down or be more cautious. Rey proves that untrained doesn’t have to mean unsuccessful, and shows well how resourceful she is. This might be a rather new weapon, but she’s a survivor used to taking care of herself, and uses that lightsaber quite well. Perhaps some Jedi training will make her truly impressive. We’ve heard that Kylo Ren’s broadsaber is a bit unstable, made from a cracked crystal, which explains why the blade looks so ragged and the whole saber seems a bit amateur. It took three viewings of TFA to really pin down what I so loved about his fighting style- it’s also quite amateur. Look at how he swings the broadsaber, how much he moves his body. Kylo Ren’s whole fighting style is an expression of how poorly trained he is in the dark side, and how much more learning he really has in order to be what he so wants to be. Kylo Ren originally seemed to be quite an intimidating villain, and after we all saw TFA and realized that he’s still very much a learner, watching him fight is just such a good way of explaining his personality. Though he survives the fight with Rey- because she realizes that killing him would lead her towards the dark side- there is no way he’s seen the last of her. Kylo Ren is too inexperienced with that ridiculous broadsaber to never use it again, and what might he be like, well-trained? I hope we get to find out. We can’t forget that Finn has also used that lightsaber a few times. We still don’t know if he’s going to be Force-sensitive, but he does get a few points for effort. Even though stormtroopers are most associated with blasters, seeing the “Traitor!” stormtrooper with a bladed weapon of some sort indicates that Finn probably has some experience with things that aren’t blasters. He’s also clearly a quick learner, based on his figuring out TIE fighter and Millennium Falcon cannons. His courage in facing Kylo Ren is remarkable, and though Finn might not end up being the Jedi hero of the story, he does hold his own much better than we’d expect. Maybe it’s seeing Rey tossed against a tree that makes Finn brave enough to take on Kylo Ren, but it’s surprisingly successful. It’s also an excellent indicator that Kylo Ren is not actually that good with a lightsaber; a competent swordfighter would probably have destroyed Finn much faster and with fewer trees being destroyed. The same goes for Rey picking up the lightsaber; even if she does have some idea of how to use it, if either she or Kylo Ren had been trained, it would have been more showy fighting and less demolishing everything around them accidentally. Lightsaber combat has as much to do with putting on a good show as it does with technique. Much of the Star Wars fandom makes fun of the prequels, even those of us who quite like them. But you can’t deny that the lightsaber fighting is very well-done, and the fight choreography is fun to watch. It establishes well that lightsabers are both bladed and pointed weapons, and can be used for stabbing as well as slashing. This is an important distinction- a Jedi attempting a precise hit will use a completely different technique than a Sith seeking to do as much damage as possible. In the Essential Guide to the Force, there is a double-page spread detailing the different Jedi lightsaber forms. It might no longer be canon, but it’s still a very useful reference. With how liberally Legends details are sprinkled within the new canon, some of those lightsaber forms might just come back here and there. Somehow, someone has to figure out how to pass on the traditions of lightsaber combat. Order 66 clearly destroyed most Jedi knowledge of lightsaber combat. With very few Jedi left, how did Luke learn to use a lightsaber? Based on his duel in Cloud City, probably not exceptionally well. Yoda probably taught him the basics, but just how much can you teach someone very quickly when you’re actually trying to teach them how to defeat Darth Vader and the Emperor? Luke’s fragmented Jedi knowledge was probably passed along to his new Jedi students, Ben among them. Did Ben, now Kylo Ren, learn much more from Snoke? Possibly, but based on his combat skills, possibly not very much. 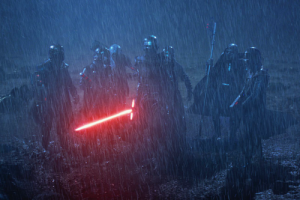 Other than for show and for property destruction, Kylo Ren doesn’t seem to have much need to use a lightsaber. Let’s look again at that duel between Rey and Kylo Ren. It really does seem like Kylo has very little experience fighting another lightsaber-wielder. Rey, however, has probably fought people who are carrying staves or some similar hand-to-hand weapon, and she doesn’t seem to be entirely out of her element. She might have no Force training, no idea of what she’s capable of, but at the least, she has figured out that the lightsaber is endlessly useful and her opponent is intimidating if not as skilled as expected. It’s fascinating to watch a well-choreographed lightsaber battle. I maintain that Obi-Wan and Anakin’s duel on Mustafar is possibly the most spectacular one anywhere in the Star Wars films, and is also accompanied by the best lightsaber-fighting music. 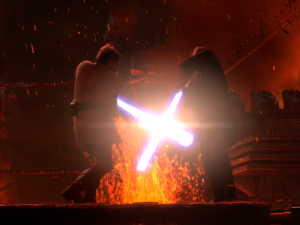 The all-out battle between two highly skilled fighters is fascinating to watch; they turn their environment into both shield and extra weapon, and are clearly a good enough match that they can’t very well get through each other’s defenses until Anakin does something stupid and gets his legs and other arm cut off. Will we get to see something this spectacular in the ST? I sincerely hope so. It would be amazing to see Rey, confident and better-trained, take on Kylo Ren again. Just knowing the story format of Star Wars, I fully expect it will happen at some point. Rey is clearly going to be the Jedi hero of the story, and that demands that sooner or later she and Kylo Ren will meet again. How will their fighting styles differ by that point? Perhaps Kylo Ren will have figured out better lightsaber construction or learned to not swing the broadsaber in such a way that it moves his whole body and opens up lots of lines of attack? Maybe we could see Rey with a double-bladed lightsaber, to match her staff more closely? A fan can dream. But I’m excited to see it. As I watched the movie again, I found I loved how wild and raw Kylo’s technique was… he had some nice, pretty flourishes… but when it was time to attack he’d sweep in almost like a sidearm baseball pitcher, all torque and power… but just raw. Rey comes in with those powerful thrusts (keep your distance, Kylo!) — and that almost reminded me of how the Emperor fought. It was interesting and entertaining – and should they tangle again, it will be a different combat. Star Wars Rebels has actually re-canonized at least one of the old lightsaber forms–Form III, which was taught to Kanan Jarrus by Jedi Master Depa Bilaba. (One presumes that this implies the existence of Forms I and II). Actually all lightsaber forms have been canonized.